First up, just a reminder that I've got a giveaway going on right now to celebrate my 3 year blogiversary. If you haven't entered to win the Simply Screen Custom Silk Screen Kit from Plaid then click over to this post and simply leave a comment to enter! 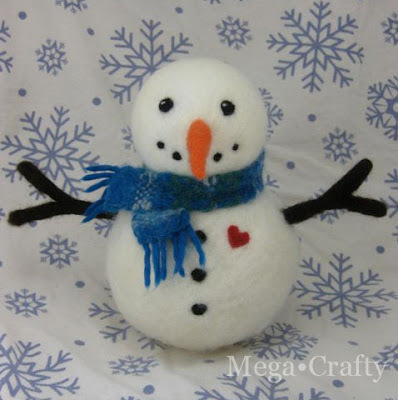 Now after all my complaining and struggling with felting white wool and finally making a snowball, I thought you should see what I created with it. He's kinda warm and snuggly for someone who's supposed to be made from snow... but it's probably because he's got a big heart. 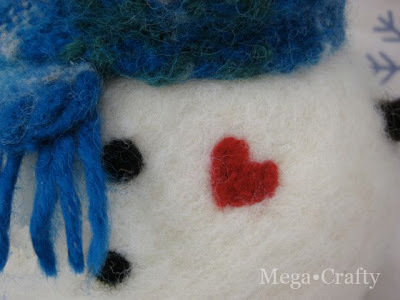 I made him by using a combination of wet felting and needle felting. 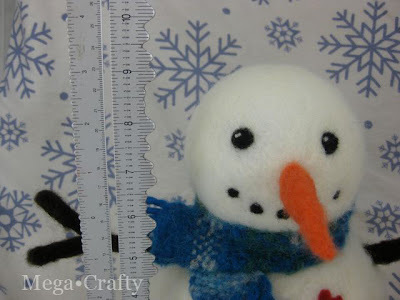 That's why he's much larger than a normal needle felted piece (at just over 9 inches tall). I also wove the scarf from scrap yarn and felted that too. When I first started the snowballs this was the project I had in mind. As I struggled with the white wool I thought "if this actually works it will be the only snowman I make because this is too hard to felt" but now that he's all done I kinda want to make him some friends. awww! The snowman is SO cute! Great job! He is a total doll! Love it. You did a great job. 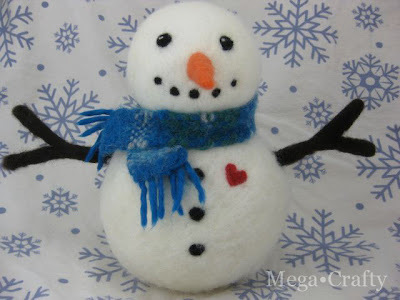 ha,ha, of all crafters I think you are tops in personality department,if you have something say you say it...lol,lol,Love snowman..keep up good work gal,,ha,ha, 'Cookie"
I collect snowmen and I have to say this is the cutest I've seen. OMG I do love your snowman to pieces! I should have guessed you had big plans for that snowball! And yes! You will find, just as I have, that you want to make more and more and more! I think it has something to do with that sweet happy face! 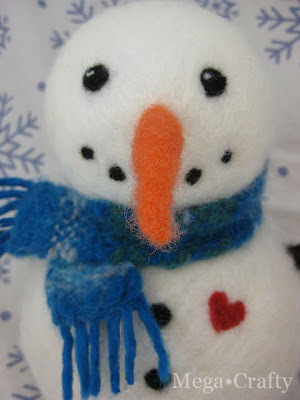 A snowman to melt the heart!!! 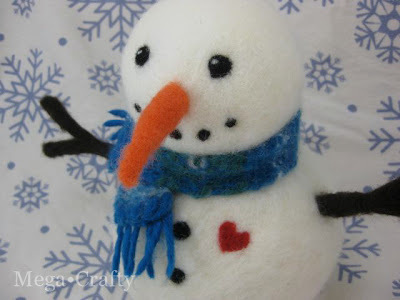 He's adorable and worth the struggle...says the one who didn't do the felting, lol! Thanks for these comments, I love them! And for the felt conquering support. Cookie- I do have the sometimes bad habit of saying (or blogging) exactly what I'm thinking. Shirley- That's probably the sweetest thing you could have said about this snowman. Thank you! Kookie- I wish I had though of that one. I would have used it for the title of the post!! Craftymoose- LOL. I agree, just remind me that's it's worth it when I'm complaining about the felt while making another one. What a cute snowman! Beautiful work!